A few years ago, I started noticing that my memory, a source of pride for me, had some weird gaps in it. Some old, some new, some more than happy to lose. But also really scary--the fright of Alzheimer's always looms large these days, doesn't it? It's tough to know what to do about that kind of thing, but I figured exercising the memory couldn't hurt. And one of the things I'd been doing on a rather casual basis was birding, so I decided maybe I should work a little harder at it. Try and get better at identifications. See what I could see. Learn what I could learn, about behavior, habitat, calls, and identifying plumage. 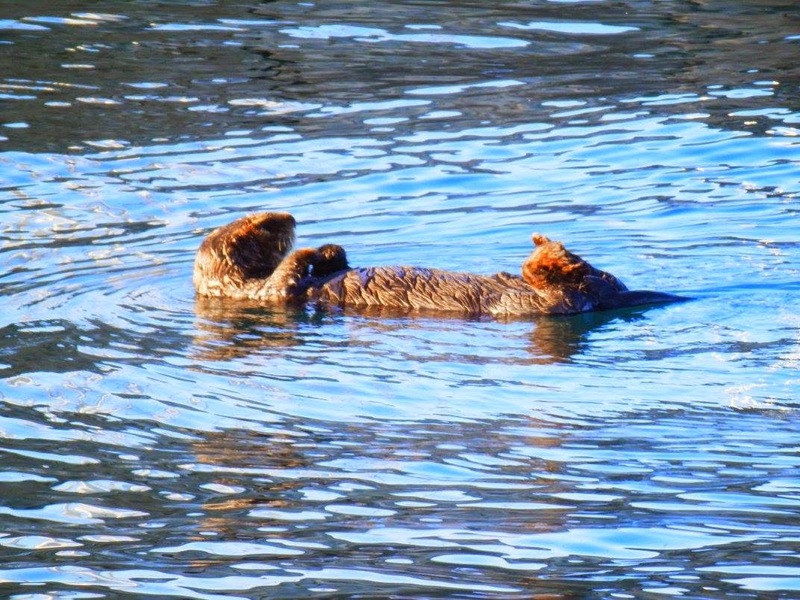 Plus, getting out into nature, especially when you live in a place like Alaska, isn't such a bad thing either. I'm really very lucky to have several friends and colleagues who are excellent birders who teach me, drag me to events where I can learn more, who will laugh with me when I do a happy dance at seeing a common eider for the first time, and who will tell me that yes, that yellowlegs that called from the top of a tree above my head for about 45 minutes in late summer in Cordova until I was ready to start screaming "shut up, shut up, shut up" was indeed probably doing so to gather around him or her a group of shorebirds with whom to migrate south after the breeding season was over. And I'm even luckier that I have a job that I love, with decent leave time, that pays me well enough that just occasionally I can run away somewhere interesting for a few days to see what I can see. (And by interesting, I mean like Nome or Monterey. Not Peru or the Lake District. I don't get paid that well.) By the way, go to Monterey. Even in November. Even if you're not into birds, the scenery is spectacular if you like the rugged coastal thing and there's always the whales and otters. Despite the best efforts of my friends and colleagues, and despite some dedicated birdwatching trips this year, I'm still a pretty bad birder. It's hard to feel like I'm any good when I have to pull out the guide every time I see a loon. Or a warbler. (I think I might have finally got to the point where I can ID a song sparrow on sight.) I don't mind that, really. Tonight I finished reading Kingbird Highway by Kenn Kaufmann, which among other things, was a bit of a cautionary tale about getting too focused on numbers instead of enjoying the learning process. I don't find it hard not to get lost in the numbers, I seem to be missing whatever the genetic component for competition might be, but I do like to keep track of what and where I've seen birds for the first time. 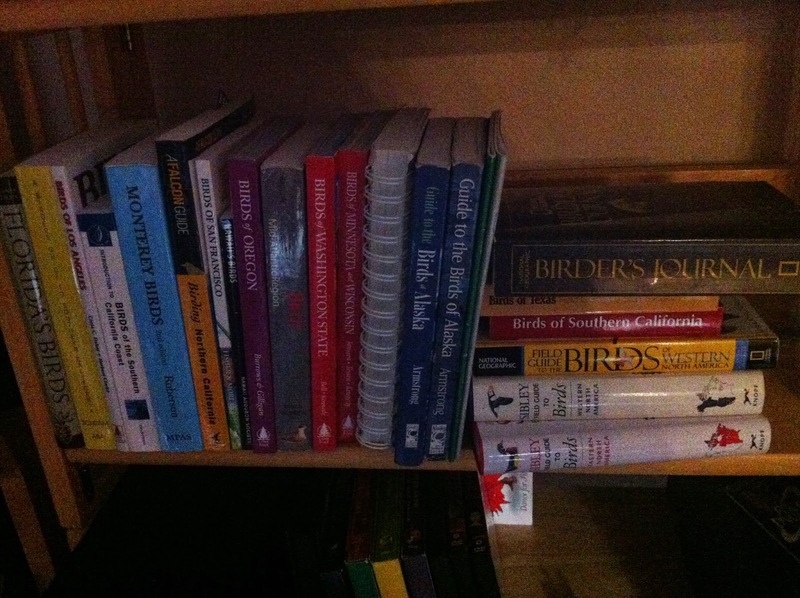 I may not be competitive about bird counts, but I appear to have developed some compulsions regarding the acquisition of bird guides. So my life list is somewhat unique. I didn't add in an American crow until 2011. My record of the Northwestern crow pre-dates that by seven years, the very first year I started writing down when and where I was seeing them. 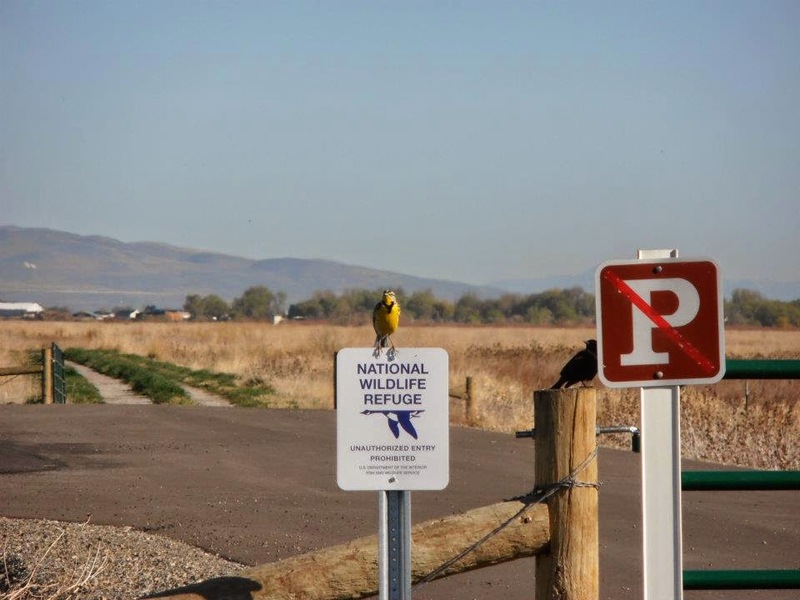 A friend from the intermountain west took me birding at the Bear River Refuge in Utah in spring 2012 and kindly concealed her utter shock at my not knowing what a western meadowlark looked like. This is what a western meadowlark looks like. And that's a redwinged blackbird partially hidden behind the no parking sign. Anyway, that was all a very long intro to my list of this year's birds. Again, I'm not so much with the concept of a Big Year--I'm just not that competitive, but I thought it would be an interesting look at what I'd seen in one year which, with a few exceptions, I hadn't made major efforts to go birding. I had a few trips where I didn't do any birding at all. I also didn't take my annual boat tour out of Seward this year, so some typical-for-me Alaskan birds aren't represented. But not all my lifelist additions represented here are boring-for-you birds. A short weekend trip to Kodiak this spring to celebrate a friend and colleague's achievement resulted in the addition of the Emperor goose. Take a few seconds to go check out that range map. 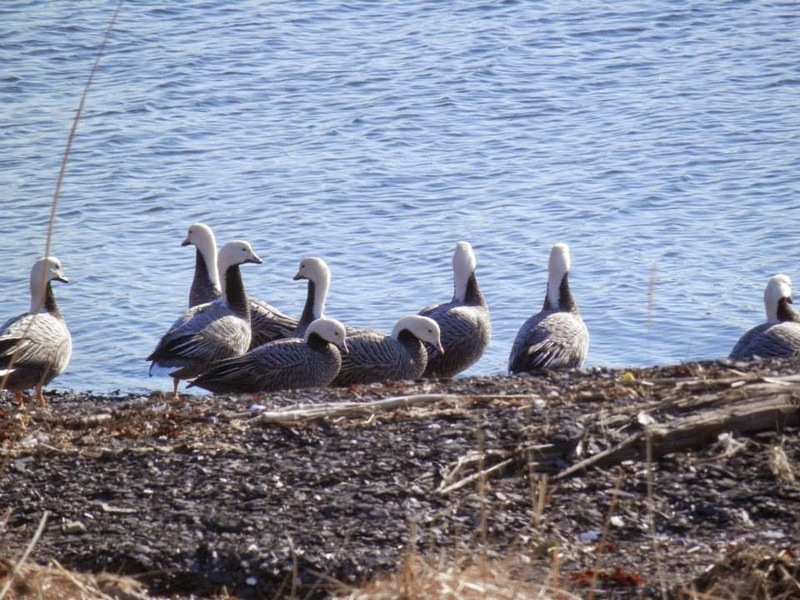 There's a flock of them that winter every year just south of the Coast Guard base about 15 minutes by road south of Kodiak. By the hundreds. Crazy, right? And I've seen them. Gorgeous birds. So here's this year's list. I'm putting it up in mid-November because I don't have any other out-of-state travel planned and there's nothing missing here typical to Anchorage winters, short of a Bohemian waxwing or 50. (I probably saw some in February and just forgot to write them down. That's the more innocuous non-worrying part of my memory loss. When something is so common that you know you've probably seen it a bunch of times and just didn't make a point of remembering it.) In the meantime, I've learned a few things. With the help of some amazing people along the way. Having problems recognizing surfbirds from amongst the huge numbers of similar looking shorebirds out there? They tend to prefer rocky shores to sandy/silty/muddy ones, the black markings on their tails are pretty unique, and after the one guy in Homer said "they look like the hockey players of the shorebirds" I think I may just have them figured out. Maybe. We'll see, come next spring and the shorebird migration north. 172 birds total for 2014, 49 additions to the life list--those are in italics. Not a bad year. And you know what? I still remember where I saw most of them. That's not bad at all.